It’s a simple equation – outscore your opponents and you’ll win the game. But, in order for that to happen you’ll need to ensure your strikers can not only strike the ball properly but make the right decisions under pressure. Developing shooting and finishing skills is as much about making the right decisions as it is about refining the individual techniques of a certain type of shot. 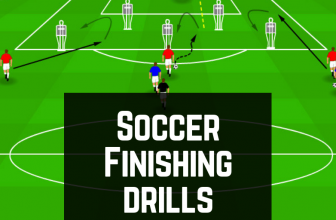 In this drills guide I have outlined 10 simple but highly effective soccer finishing drills that you can use, adapt and take ideas from for your training session. Age Group Suitability: Most of the drills can be adapted to suit players of all ages. I’m always hesitant to list drills under age groups as it doesn’t always tell the full story. Of course, there’s an ideal developmental path your players will take as they get older but what one 8 year can do with ease might take a 15 year old months to learn. You job as a coach is to lay the foundations so your players can develop while adapting if need be along way. Key Coaching Points: Again, I’ve gone into the bulk of the coaching points above but I have also listed some additional and the more important coaching points for each drill below the diagram. As this topic focuses on finishing it’s going to be pretty important that you have a soccer goal to work with. 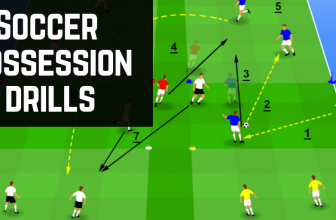 Now, there are times where you can completely do without a goal, but in general you’re going to want to have some sort of soccer goal to provide that all important instant feedback factor for your players. You’ll also need some cones to mark out any drills dimensions and player starting positions and finally I’d recommend having at least 1 soccer per players to easily identify teams. Other than that, there are a few additional pieces of equipment needed for some drills – I have linked to, or listed these below each drill. Can you hit the ball across the keeper? Simple set up that only needs 2 players. You can however add a goalkeeper into the mix to make things more realistic and increase the challenge for your attackers. If you haven’t got any goalkeepers – use a goal with targets in each of the corners or grab yourself a set of ready-made soccer goal targets here. Player 1: Player 1 starts with the ball. They dribble forward and take a shot on goal. Once they have take their shot they immediately turn, sprint back to Player 2 to play a 1-2. Player 1: Player 2 passes the ball into Player 1 who lays the ball off for Player 2 to take a shot on goal. Progression 1: Again you can start without anyone in goal then progress to using your keepers. Progression 3: Finally progress to using real defenders. 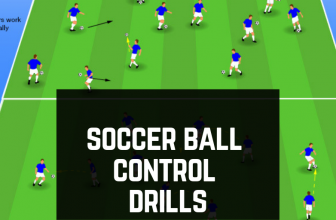 Be aware though this drill will now go from a 2 player drills to a 3+ player drill. 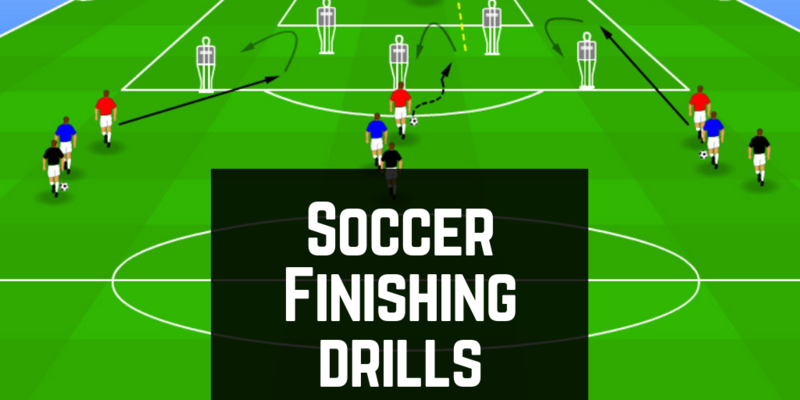 Again for this drill you’ll only need a few cones to mark each players starting position, a soccer goal to aim at and possibly a goalkeeper to make the drill more realistic. Again, you could use some soccer goal targets to develop player accuracy. Player C: Plays 2v1 against the other players and tries to get a shot on target. This is a great drill, that is simple to setup and allows for multiple progressions. Each step of the drill build upon the last and helps develop not only the finishing part of their game but their attacking skills as a whole. Progression 1: Progress to using 2 or 3 consistent defenders. Instead of the attackers switching to defenders they now link up with each player slowly building up to a a 2v3 / 3v3 by the time the last attacker comes in to the play. 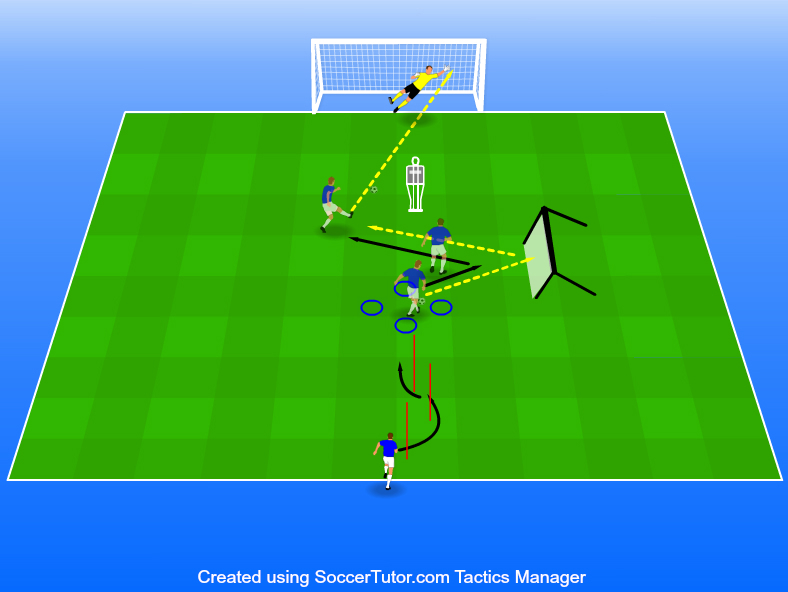 For this drill to work you’ll need to a normal pitch setup with 2 goalkeepers either end. Split your group into 4 separate groups and place 2 groups either side of the pitch near the goals and the other two groups opposite each other on the throw in line. The drill starts with one of the teams near the goals (Player A) choosing a pass. They can pass two either side of the pitch. Whoever they pass the ball two will become the 2nd attacker. Once they’ve played the ball they sprint forward to support the attack while a player from the opposite side (Player C). runs to defend the attack. Once the attack is over the drill starts again from the opposite side. Progression 2: Add some sort of pressure by getting attacking players to get a shot on goal in a pre-determined time ie. 10 seconds to score a goal. once the 10 seconds are up the attack is finished. 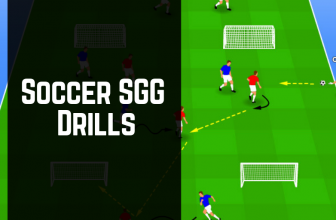 To set this drill up you’ll need to split your players into groups of three. Each team has a go at attacking the goal. The first team attack without any defenders. Once the attack is over ( a shot has been taken on goal) the team immediately transition to defenders to defend the next three players attacking. This continues until you stop the drill to coach you key points. 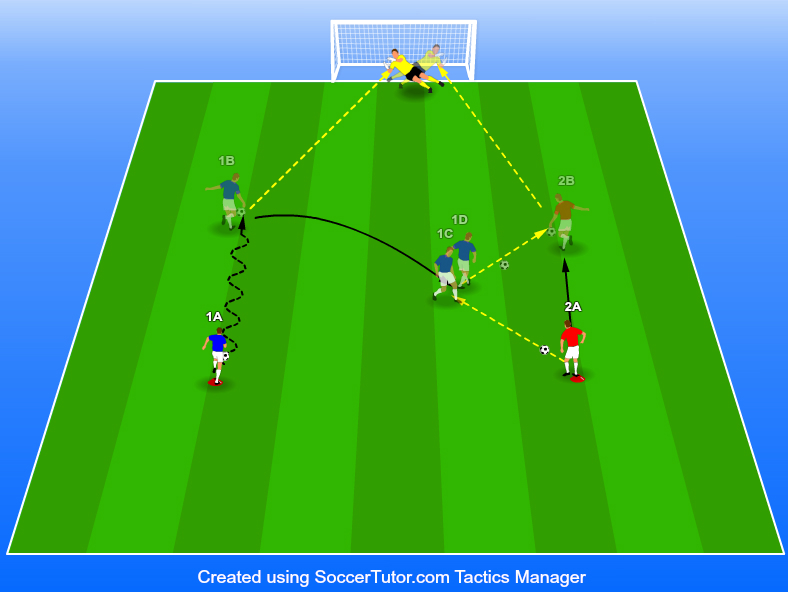 This is a great drill for not only working on your attacker ability to control and use the ball effectively in tight spaces around the goal area but also helps them develop the ability to control the ball coming in from different areas around the box. You’ll need at least 4-5 players on the outside of the 18 yard box and one player in a boxed off area in the near the penalty spot. Each player round the outside takes it in turns to play the ball in to the attacker in the box. The attacker in the box must control the ball away from the defender and take a shot on goal. Each player on the outside can vary the heights, types and power of their passes to mimic a real game scenario. Progression 1: Progress from using a mannequin to using a real defender. Again, you can break this progression down to using an active and passive defender. 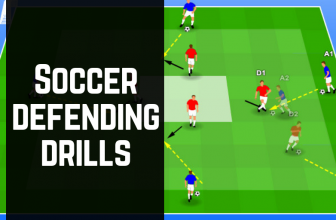 This is a functional drill that develops; technique, speed and agility of attack, dribbling and shooting. For the setup, split your group into 4 ‘teams’. 2 attacking teams and 2 defending team. Line 2 teams up either side of the 18 yard box with a set a off slalom poles or mannequins to use as the obstacles. In this example, the blue players are the defenders while the whites are the attackers. Each side (left & right) take it in turns to attack and defend. Each attacker starts with a ball. To start the attacker dribbles in a zig-zag shape through the slalom poles. Once the attacker passes the first blue pole the defender starts the sprint through the blue poles in the same zig-zag shape. The aim is for the attacker to get through the poles and take a shot on goal before the defender can get through the poles to stop them. Alternate side so the drill stays consistent and smooth. The drills starts with using 3 players. You’ll also need some cones to mark out each players starting position but feel free to remove them when your players understand the drill. To start, Player A plays a pass in to Player B. Player B takes one touch out of his body and starts to dribble across the top of the 18 yard box. Player C then starts to make a run, Player B plays the ball off and Player C takes a shot on goal. 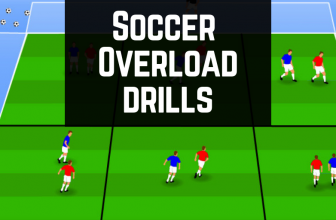 This drill can be used as a stand alone drills for 1 player or used as part of bigger group drill as long as you have enough space. The drill involves using basic equipment such as; cones, mannequins and you could add in other pieces of equipment such as rebounders and slalom poles if you wanted to. 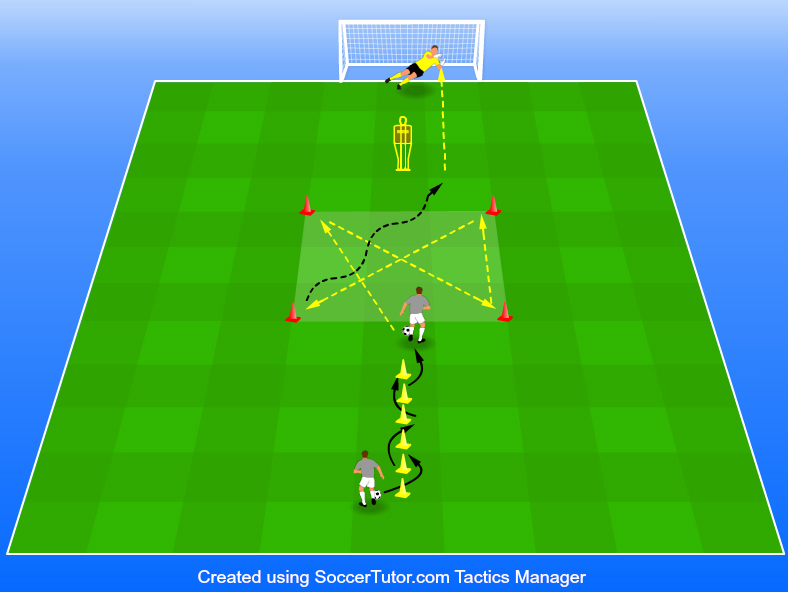 To start the player dribbles through the cones. Once they reach the box, they’ll dribble to each cone using a series of movements; drag backs, side shuffles, toe taps. The pattern they run is entirely up to you as the coach. Once they complete the box pattern, they break out and take a shot on goal. 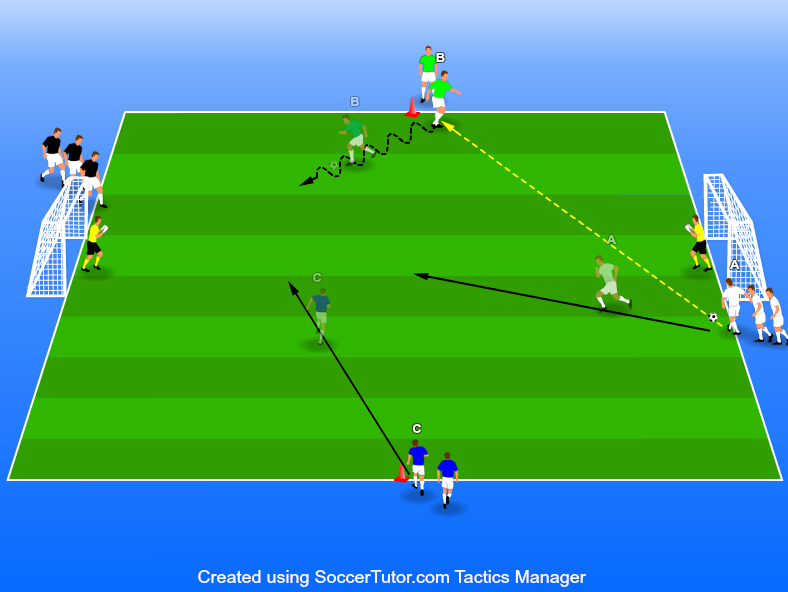 For this drill, split your group into 3 ‘teams’. Then situate them outside the box; left, center and right of the 18 yard line. The team in the middle gets to choose who they play the ball too. Whatever side they play the ball too becomes the player they support in attack. The player that doesn’t receive the ball becomes the defender and needs to get across quickly to close down the shot on goal. Progression 1: Create a 2v2 situation where two defender from the team that didn’t receive the ball sprint to close down the shot. The drill is great for solo work. It’s a simple drill that requires a few pieces of conditioning equipment and a soccer rebounder to play the 1-2. Again, you don’t need to follow the exact outline I have above but, make sure you get enough ‘stations’ to make the drill as realistic as possible.